Life In A House of Blue ! : Cart-Stopper - 'Must-Have' Baby Shower Gift! Home > press > Cart-Stopper - 'Must-Have' Baby Shower Gift! Cart-Stopper - 'Must-Have' Baby Shower Gift! Cart-Stopper™, the ideal & affordable baby shower gift in today’s economy. Reduce her stress by giving your favorite mom-to-be a “second pair of hands” for less than $10! CITRUS HEIGHTS, CA --- July 2009 --- While most Americans are looking for ways to reduce their overall cost of living and daily stresses, there’s one thing that simply cannot be compromised…the safety of your child. Give the gift of safety to that mom-to-be with a Cart-Stopper™, an affordable ‘must-have’ child safety product. In today’s society, more and more parents are finding themselves tackling shopping errands alone. The simple task of securing your grocery cart while you safely load/unload your child(ren) becomes increasingly daunting. Cart-Stopper™ is the simple & effective solution to the run-away grocery cart. 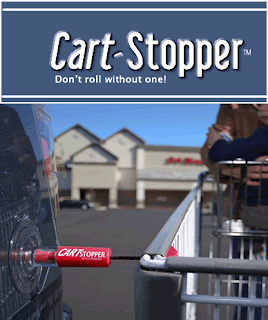 Cart-Stopper™ secures your grocery cart to your vehicle while you safely load & unload your children & your valuables. Cart-Stopper’s™ patent-pending design creates a “second pair of hands” so you can secure your child(ren) in their car seat(s) while your grocery cart is secure next to your vehicle. No more worries about your second child rolling away in the grocery cart! Cart-Stopper™ reduces stress and creates peace of mind! Simple to use and small enough to store in a purse, glove box or trunk, Cart-Stopper™ can be purchased in 3 different colors at www.cartstopper.com for only $9.99/ea, or call 916-220-9946. Even though everything is flat in Florida, my cart always rolls away from the car. This would be way cool. It's always characteristically woven right from mulberry choice moth cocoons and therefore the first of all scarves happen to be omega replica sale stated in Lyon, Italy. All the Hermes scarf is normally grip personalised and additionally prepared apart that should be about advanced superior quality which usually pull in all the skin cream for the model country to make sure you attest to the software. A lot more Cotton watches are likewise put into use as long as they are now being grip stitched through craftsmen. Hermes really are pros in the case of supplying alternate options or possibly products on the subject of you need to scarves to choose, simply because they enjoy a gallery about breitling replica sale alternate options relating to most of the variety of modest option, elder versions accessories. about scarves. Gals de gala scarf is about the most well-known scarves available considering that it advertised in hundred dollars an array of endless instruments for the unit catapulting the software to the past from this supplier. A fabulous Hermes scarf will never can be bought bargain like the country's about the most subtle anywhere available through skin cream about The show biz industry & a number about other sorts of famous people. Hermes Larnaca Airport terminal replica chanel is normally Cyprus' essential essential trip, by means of enormous essential tourists arriving straight to Larnaca right from all over.